Periodontal disease can be kept from progressing with regular treatments and cleanings with Dr. Trujillo. 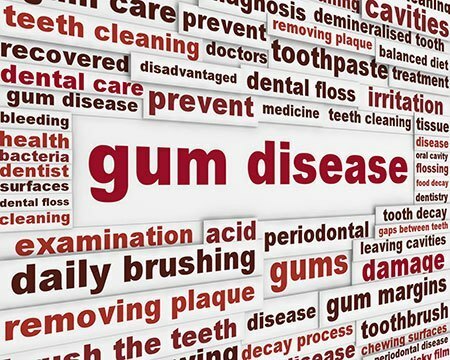 Gingivitis and gum disease is one of the most common issues that we all face. It can be embarrassing and hard to cope with. But working with a periodontist like Dr. Trujillo, it can be treatable. With his expertise and proper dental care you can get your healthy smile back! Below we break down the different stages of Periodontal Disease and what symptoms they cause. If you have any of these symptoms or feel any discomfort currently with your gums, please give us a call so we can set up an appointment with Dr. Trujillo to help heal your gums. In healthy gums, the tissues is pink, firm, and free of any redness which is a sign of inflammation. They rarely ever bleed while you brush or floss. Going in to visit Dr. Trujillo twice yearly for cleanings and normal check-ups are usually all that you need to maintain health. This is the mildest form of periodontal disease. Your gums start to become red, swollen, and bleed easily when you brush them. Most of the time there's little to no discomfort. The most common cause is often inadequate home care and/or lack of professional cleanings. It is also the most common type of periodontal disease. Gingivitis is reversible with professional cleanings and good home care habits. Gingivitis that is left untreated can advance to periodontitis. Over time, plaque can spread and grow below your natural gum line. Toxins are produced by the bacteria in plaque and begin to irritate your gums. The toxins stimulate a chronic inflammatory response where your body in essence turns on itself. The tissues and bone that support the teeth start to break down and become destroyed. Your gums separate from your teeth and form pockets (a space between your teeth and gums) that become infected. Symptoms may still be mild at this stage. The way to fix this may require a non-surgical treatment called scaling and root planing (deep cleanings). As the disease progresses, the pockets deepen that were created from mild periodontitis and more of your gum tissue and bone are destroyed. The symptoms are still pretty mild, but may begin to include receding gum lines and it's a lot easier for food to get stuck between teeth. Eventually, teeth can become loose and can be lost or may have to be removed by Dr. Trujillo. Treatment at this stage still begins with scaling and root planing but could require more advanced procedures to bring it under control. This stage is characterized by a lot deeper pockets, gum recession, loose teeth and even the loss of teeth. Treatment usually requires advanced procedures that have to be performed by a periodontist like Dr. Trujillo to control its progression and restore the lost tissues. Unfortunately the only proper and best treatment is to have the affected tooth removed. As mentioned at the top of this page, if you feel that you have any of these symptoms, please contact us to schedule an appointment to meet with Dr. Trujillo. Most of us who have these symptoms are in the more mild stages of Periodontal disease, and don't require major treatments. Keep in mind though that if it is left untreated then it can become much more severe and expensive. If you have any questions or concerns please contact us and we will be happy to help you more.